Planned Parenthood and Code Pink descended on Carly Fiorina in Iowa yesterday and screamed insults and profanities at her. Then they hurled condoms at Carly. Classy. Bonus… one of the morons protesting was dressed up as a birth control pill dispenser. Drolly chic, n’est–ce pas? Quite a feat being a clown and a genocidal butcher at the same time, but these radicals pull it off. Paging Stephen King. They were furious that Fiorina spoke out against them in the last debate. Carly handled the encounter with class and decorum. She was impressive in handling these asshats. Hope she didn’t keep a souvenir. She informed at least one protester that she was a cancer survivor and cared about women’s rights as well. She also pointed out that tax payers fund Planned Parenthood, who in turn fund the Democrats. It’s a political shell game. Why, yes it is. 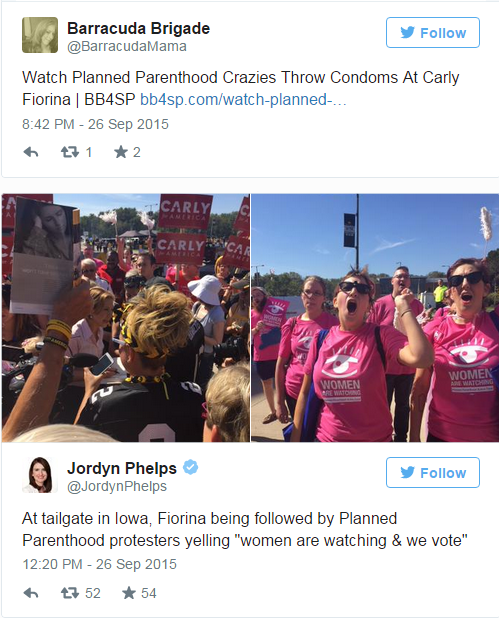 Planned Parenthood supporters and Code Pink activists showed up at a Carly Fiorina event in Iowa yesterday at a tailgate before a Hawkeyes game. They screamed insults and threw condoms at her. They are furious that she brought up their baby harvesting practices at the last debate. 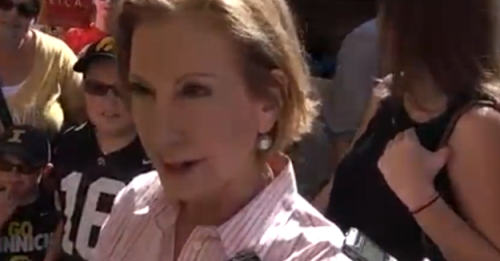 Carly was asked about a female protester she had a confrontation with. All Planned Parenthood and the commies from CodePink know is talking points and propaganda. They are demanding their right to butcher the unborn. Imagine that – genocidal maniacs have rights too. The cold hard facts of what Planned Parenthood does in their horror chambers are clear cut and out there for all to see – literally. It would have been nice if Fiorina had turned around and called them the psychotic butchers they are. I know I would have. 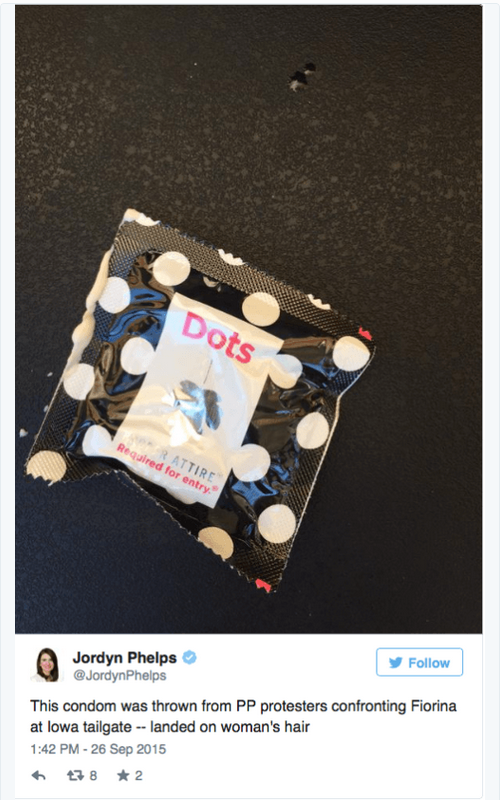 Small blessings… at least the condoms were still in their packages. This was at a tailgate party before a Hawkeyes game. These losers were shouting, “Layoffs, lies, no surprise, Carly fumbles for these Hawkeyes!” Seriously? That’s the best these brainless twits can come up with? Points to Fiorina though for the following… at one point, one woman asked Fiorina why she doesn’t support women’s health care… Fiorina responded, “Oh, I support your health care. I don’t support the butchering of babies.” You go girl!